The "Raptor" fighters previously flew to the South in December when Seoul and Washington staged their largest-ever joint air exercise, days after North Korea test-fired a missile believed capable of hitting the US mainland. 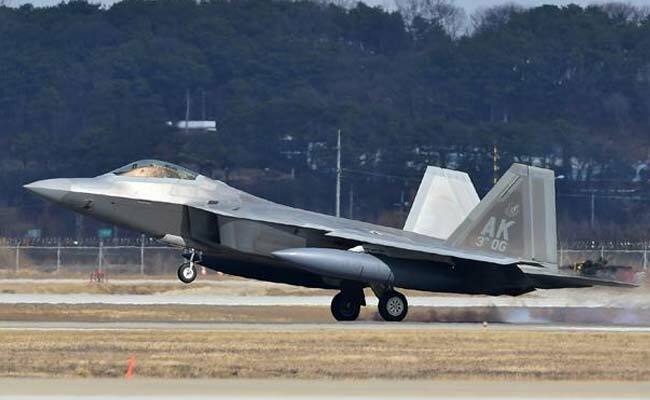 Seoul, South Korea: American F-22 stealth fighter jets have arrived in South Korea ahead of a joint air force drill, Seoul said Wednesday, despite a recent diplomatic thaw with Pyongyang. The North customarily reacts with anger to the deployment of American stealth fighters, which it fears could be used for surgical strikes against its leadership and strategic facilities. The confirmation came after local newspapers said eight F-22 jets arrived Sunday at a military airbase in the southern city of Gwangju. The "Max Thunder" drill will kick off on May 11 for a two-week run, with the reported participation of some 100 aircraft from both countries. "Max Thunder is a regular exercise that has been on the docket long before a planned US-North Korea summit", the South's Defence Ministry said in a statement. It urged news media to refrain from producing "speculative reports" about the intention of the deployment aside from the routine exercise. That request came after the conservative Chosun Ilbo daily claimed the aircraft deployment was apparently aimed at heaping pressure on Pyongyang ahead of a planned summit between North Korean leader Kim Jong Un and US President Donald Trump. The Panmunjom truce village in the demilitarised zone between North and South, where a rare inter-Korean summit successfully convened last week, has emerged as a possible venue for the Kim-Trump meeting. Chosun suggested the arrival of F-22 jets could also be aimed at bolstering security in case the North Korea-US summit takes place at Panmunjom.